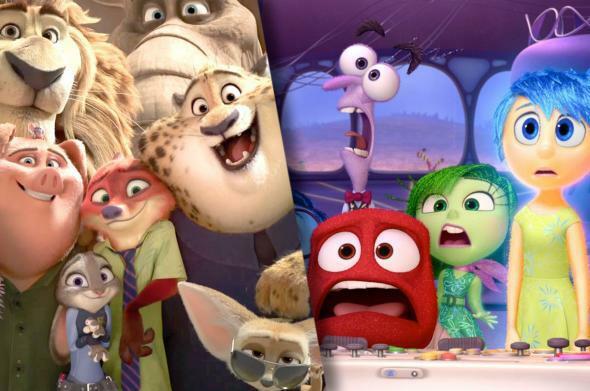 Zootopia proves Pixar isn't the undisputed feature animation champ anymore. In many ways, 2015 might’ve seemed to solidify Pixar’s place as the kings of animation. Inside Out, its first feature based on a new property since 2012’s Brave, made $850 million worldwide and won the Academy Award for Best Animated Picture, plus tallied a nod for Best Original Screenplay. With a Rotten Tomatoes rating of 98 percent, Inside Out received nearly universal praise from critics, many of whom argued that it should’ve been nominated for Best Picture as well. That success helpfully diverted attention away from the studio’s ill-fated second release of 2015, The Good Dinosaur, seemingly keeping Pixar atop the animation-outfit pecking order. But as we’ve been reminded over the last two weeks, the battle for supremacy in the world of feature animation is more crowded than most people realize. Walt Disney Animation Studios’ Zootopia made a strong $73.7 million opening domestically, the second-highest bow of 2016 so far, and another $50 million on its second weekend, topping the box office again—as of March 15, it has made a formidable $475 million worldwide. Meanwhile, its Tomatometer of 99 percent and “A” CinemaScore both put it firmly in the realm of Inside Out. And Zootopia is only the tip of the iceberg. When you look back at the last five years, it turns out that two other studios are challenging Pixar for its place as the gold standard of animated filmmaking, both commercially and artistically—and beyond them, various smaller outfits have been responsible for one, or a few, hits, including companies like Illumination Entertainment, which made the billion-dollar-grossing Minions in tandem with Universal, and Nickelodeon, which produced The SpongeBob Movie with Paramount. Blue Sky Studios makes films with Fox, including the Ice Age and Rio series and last year’s Peanuts Movie; Bagdasarian Productions has the Alvin and the Chipmunks franchise with Fox as well. And Sony is becoming a strong player, with recent hits like the Hotel Transylvania and Smurfs series. But the three dominant forces, by far, are Pixar, Walt Disney, and DreamWorks. The latter studio is the most prolific. From 2006 through 2015, they released 20 films, many either establishing or prolonging multiple huge franchises: Madagascar, How to Train Your Dragon, Shrek, Kung Fu Panda. The staying power of those titles hints at how long DreamWorks has been in the game—it might make you feel old, sad, or confused to realize that next month is the 15th anniversary of Shrek—and the name-brand recognition of its catalogue is impressive. Walt Disney isn’t nearly as productive as DreamWorks, with only eight films in that same span, but they’re on a wild hot streak. Zootopia comes on the heels of Big Hero 6, which made just over $650 million worldwide, and Frozen, which topped $1.25 billion. The film before that, Wreck-It Ralph, didn’t do quite the same numbers, with $471 million worldwide, but it received terrific reviews and marked the beginning of Disney’s return to the animation mountaintop. Over the ten-year period since 2006, Pixar—which, it should be noted, is also owned by the Walt Disney Company—has a huge edge in per-film box-office: Pixar’s worldwide average is $641 million per movie, an astonishing number, with an 83.2 percent mean Tomatometer. DreamWorks comes in at $479 million, though its 71.65 percent is the worst of the three. (With its considerably larger output, it does trump the other two studios in gross earnings.) Walt Disney trails slightly in receipts, with $472 million, but its 85.38 percent actually tops Pixar’s. Walt Disney’s small advantage in critical reception is the first indication that Pixar might not be quite as all-powerful as you’d expect. The second is recent performance. If you shrink the window to five years, from 2011 through 2015, the results change considerably: Disney becomes the leader in terms of reviews, with an average rating of 88.5 percent, and box-office performance, at a $609 million average worldwide. Pixar is nearly there commercially, with $602 million, but isolated to the last half-decade, its oeuvre looks far less impressive: aside from Inside Out, there’s just Cars 2, Brave, Monsters University, and The Good Dinosaur. DreamWorks is in a clear third, with 74.4 percent and $480 million, but it has put out ten movies in that frame, compared with Pixar’s five and Disney’s four. Those numbers also don’t include Zootopia’s reviews or receipts, which are only just beginning to come in (and will eventually boost both the five-year and ten-year box office and critical numbers for Walt Disney), though, to be fair, they also don’t factor in the same from Kung Fu Panda 3, a well-reviewed and widely seen DreamWorks picture released in late January that will up that studio’s averages. Nor are they anything approaching the last word: a Rotten Tomatoes composite of positive and negative reviews hardly does justice to a work of art as complex and intelligent as Inside Out or as lovable as Big Hero 6, and it certainly doesn’t quantify the number of parents who have listened to their children sing along to Frozen, over and over and over and over.